My post on vCloud Director Allocations Models back in September 2010 has always done fairly well in terms of view/visits. Lately I have been receiving some offline questions about how valid this article still is with vCloud Director 1.5 so I decided to go through the same exercise here. Instead of doing a full copy I will just copy and paste the characteristics section for each of the three different Allocation Models. For those who can’t be bothered the short summary is, nothing has changed… I only discovered something which I did not notice the first time around. The resource pool is not expandable! Reservations set on a per VM level for memory. This reservation is based on the percentage of guaranteed resources. Note that this will include the memory overhead per VM! When looking at the vSphere layer it appears that not much has changed. The characteristics are still the same from a Resource Pool and virtual machine perspective… However I spotted something which was apparently already part of vCoud Director 1.0 but somehow I missed this. 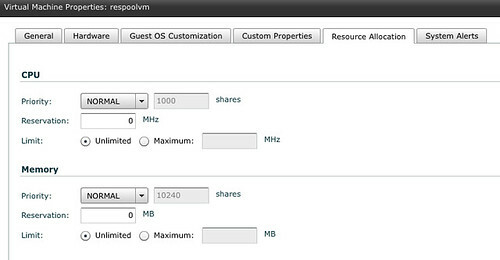 vCloud Director 1.x offers you the capability to add a reservation for CPU and memory and even allows you customize the shares! None of the other allocation models allow you to do this! Note that is is possible to set a reservation/limit for CPU or Memory with vCloud Director 1.x on a per VM level. See screenshot below, this is configurable on a per virtual machine basis! Allocation pool section you note that resource pool is not expandable, but from vCloud director under Organizations vDC you can extend the resources of related models .. Thanks for the article – some critical information here. I have a quick question relating to the PAYG allocation model. Does this correspond to the default minimum CPU reservation (slot size? The slot size is indeed 256MHz in vSphere 4.1 or lower and 130MHz with 5.0. Keep in mind that there is no relationship at all between this and vCloud Director and that vCloud Director actually sets a limit, and believe me … your VM will not be happy with only 256MHz of processing power. vCloud Express does not operate like this, and in most cases vCloud Director does also not operate like this as the default value is normally changed to 1GHz at a bare minimum. With vCloud Express, as far as I know, the vCPU is not limited at all. Also keep in mind that the amount of MHz doesn’t actually say much… Just think about “CPU” scheduling for a second. if you have 10 VMs running on a single box or 50 will make a difference for your performance.